A scene from a Hoveround commercial. Ads for motorized scooters are coming under increased scrutiny for creating the false impression that they're a convenient way to get around, not a medical necessity. 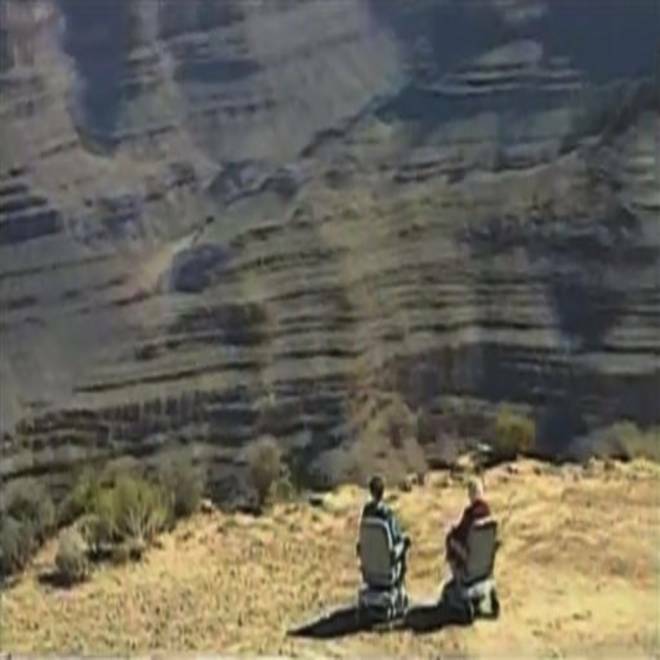 TV ads show smiling seniors enjoying an "active" lifestyle on a motorized scooter, taking in the sights at the Grand Canyon, fishing on a pier and high-fiving their grandchildren at a baseball game. The commercials, which promise freedom and independence to people with limited mobility, have driven the nearly $1 billion U.S. market for power wheelchairs and scooters. But the spots by the industry's two leading companies, The Scooter Store and Hoveround, also have drawn scrutiny from doctors and lawmakers, who say they create the false impression that scooters are a convenient means of transportation rather than a medical necessity. Members of Congress say the ads lead to hundreds of millions of dollars in unnecessary spending by Medicare, which is only supposed to pay for scooters when seniors are unable to use a cane, walker or regular wheelchair. Government inspectors say up to 80 percent of the scooters and power wheelchairs Medicare buys go to people who don't meet the requirements. And doctors say more than money is at stake: Seniors who use scooters unnecessarily can become sedentary, which can exacerbate obesity and other disorders. The scooter controversy, which has escalated with a government raid on The Scooter's Store's New Braunfels, Texas, headquarters last month, underscores the influence TV ads can have on medical decisions. Like their peers in the drug industry, scooter companies say direct-to-consumer advertising educates patients about their medical options. But critics argue that the scooter spots are little more than sales pitches that cause patients to pressure doctors to prescribe unnecessary equipment. The Scooter Store and Hoveround, both privately held companies that together make up about 70 percent of the U.S. market for scooters, spent more than $180 million on TV, radio and print advertising in 2011, up 20 percent since 2008, according to advertising tracker Kantar Media. Their ads often include language that the scooters can be paid for by Medicare or other insurance: "Nine out of ten people got them for little or no cost," states one Hoveround ad. The Scooter Store took no action to repay the money until February 2012, when the Health and Human Services' inspector general threatened to bar the company from doing business with Medicare, which accounts for about 75 percent of its income, according to its congressional testimony. The company said the government's estimate was flawed and that it was willing to repay $19.5 million in overpayments. The company has paid about $5.7 million, with the rest scheduled for repayment over a 5-year period to be completed in 2017. In recent months Sen. Richard Blumenthal, D-Conn. and other members of the Senate Aging Committee have pushed Medicare to recover the millions of dollars spent on unnecessary scooters each year. Those purchases totaled about $500 million in 2011, the latest year available, according to a report by the Department of Health and Human Services' inspector general. Under the program, government contractors in seven states review patients' medical documentation to make sure they need a wheelchair or scooter before approving payments for a device. The program is being tested in a small number of states — including Florida, California and New York — because the government must pay contractors extra to review additional paperwork. The reduced payments are taking a toll on the company, which was founded in 1991. The Scooter Store has spent nearly $1 million lobbying Congress over the last two years, almost exclusively focused on the Medicare review program. And the company laid off about 370 employees in the past year, blaming the reduced payments it's been getting from Medicare. The mass layoffs followed a raid in February by about 150 agents from the FBI, the Department of Justice and the Texas attorney general's Medicaid fraud unit at the company's headquarters. "This raid is a welcome step toward cracking down on waste and fraud in Medicare," said Blumenthal, the Connecticut senator. "I have urged action to stop abusive overpayments for such devices — costing taxpayers hundreds of millions of dollars and preying on seniors with deceptive sales pitches."